This post will mean a good deal more to you if you read our posts on this image, here and here–some of the most popular posts we have done. 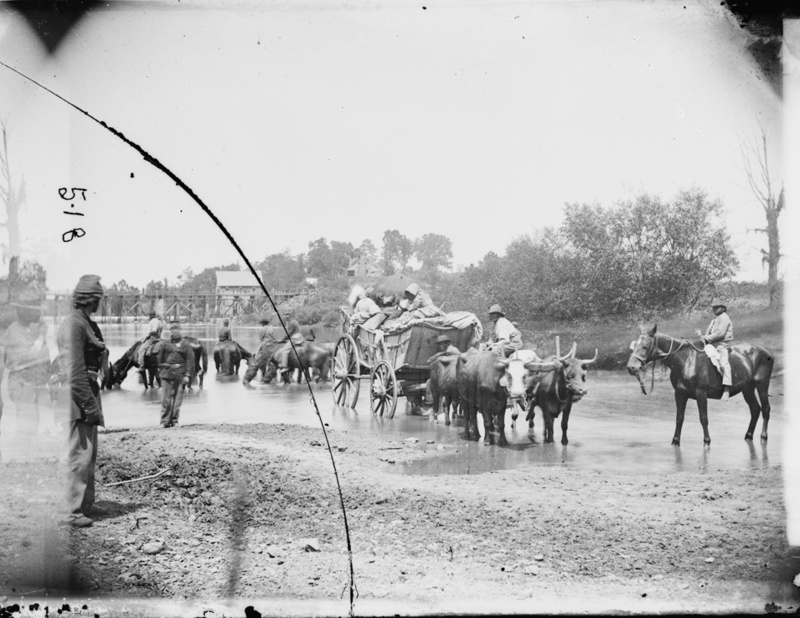 This image, and a close companion, were taken on or about August 19, 1862, during Pope’s retreat from Culpeper County. 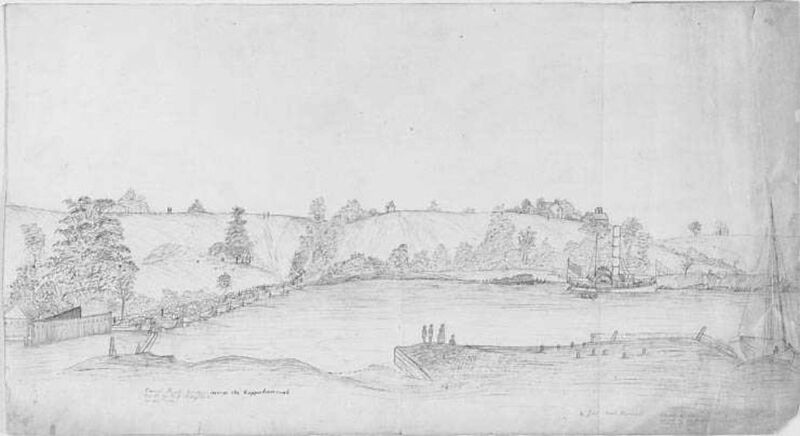 The image shows slaves crossing the Rappahannock River at Tinpot Ford, just below the Orange and Alexandria Bridge, visible in the background. It is one of the most famous images of the Civil War, used constantly to illustrate slaves’ efforts to achieve freedom. It has become ubiquitous, even a bit of a cliche, largely because no other image comes close to matching its power. 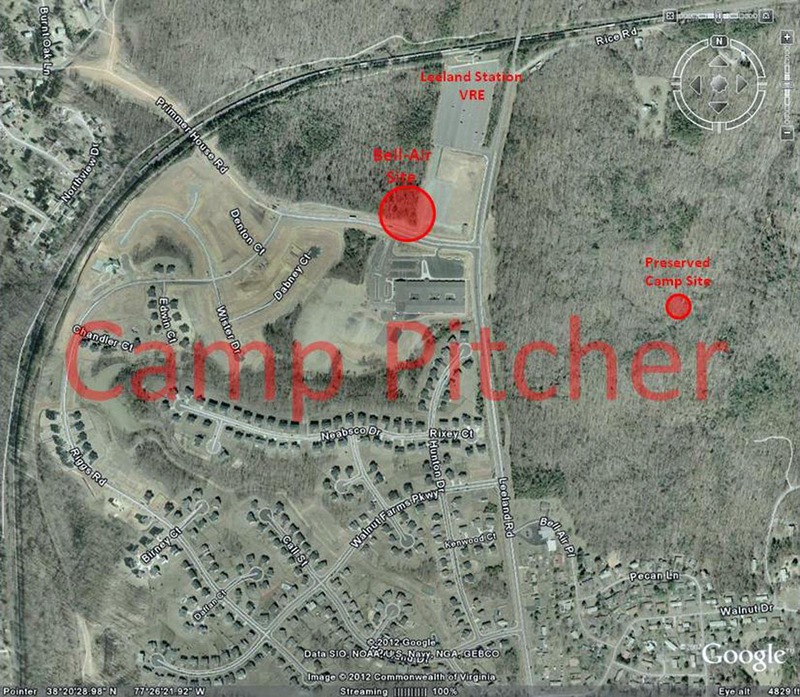 In our look at the images last year, we were able to show where the image was taken, but did not have access to the site itself. Our friend Clark B. “Bud” Hall, an indefatigable and unconquerable preservationist and maven of all things Civil War Culpeper (he is the only one of the Virginia crowd of preservationists to have his picture on the front of a national magazine, so far as I know), recently managed to visit the site and kindly share with us this image of the site today. His explanation follows. This is Tinpot Run Ford, and the old road from Culpeper approaches the river from the south (still there). 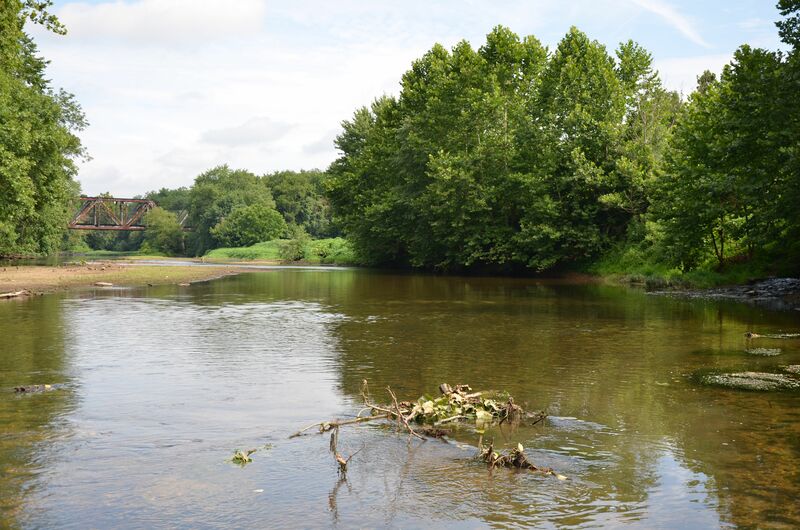 The ford road comes out of the river on the north side and is still quite evident where it [crossses] the river into Fauquier. If you look carefully [at the original], you can discern Tinpot Run entering the river. This is a modern-day view (July 2012). The ground I am standing on is the sandbar situated in the river you can see above. The river curls around to the…south from there. As is shown in the original images, you can barely discern Tinpot Run to the right. My picture is taken a bit closer than O’Sullivan’s original image, and you can see the bridge (re-built) appears closer–which is a function of the zoom lens distorting the natural depth of field.. I will return to this scene on August 19 and take the picture on or about the same day it was taken 150 years ago. Our great thanks to Bud Hall for passing this image along. 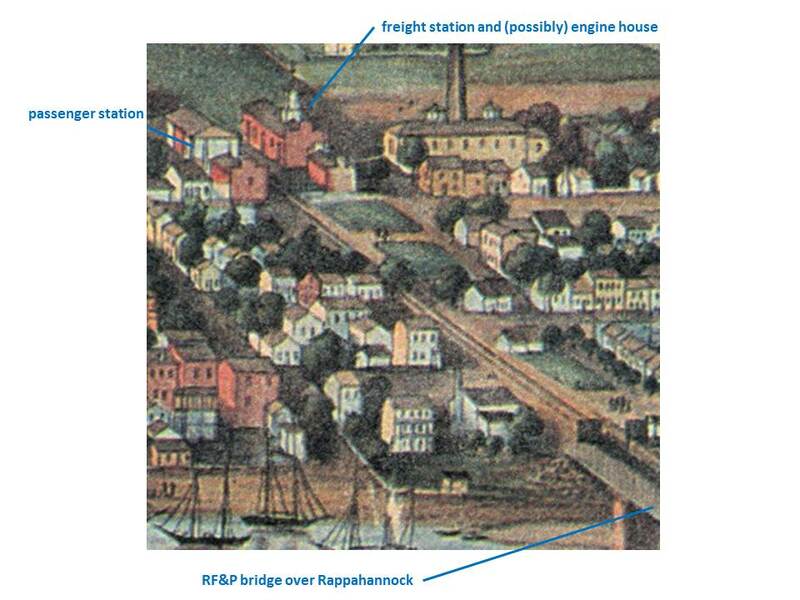 Fredericksburg under Union occupation in May 1862, before the repair of the railroad bridge into town. Looking NW. 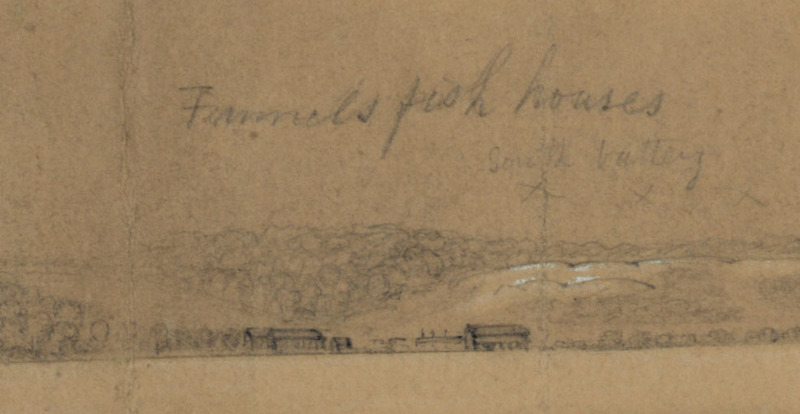 One hundred and fifty years ago tomorrow, the Fourth of July dawned in Fredericksburg–a beautiful, clear, breezy day. 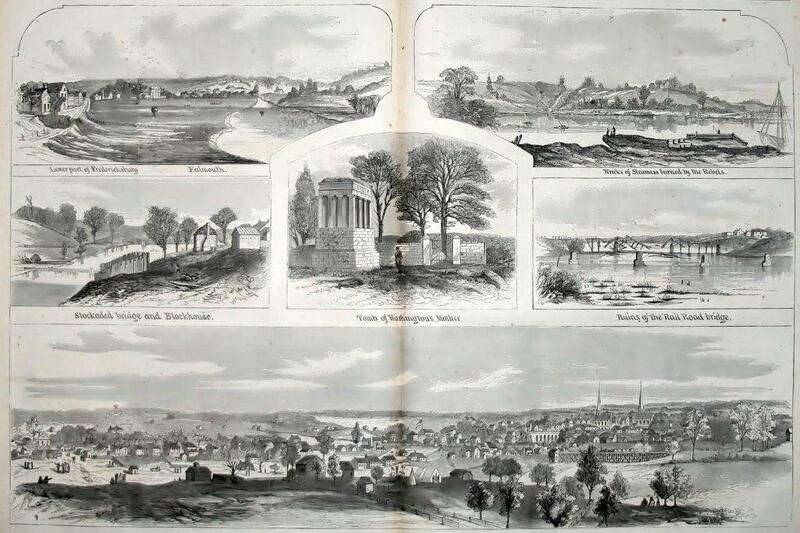 For eight decades the town had celebrated the nation’s independence; but in 1862, residents in the town passed the day quietly, without notice, their attention drawn more by the news of the massive fighting around Richmond and hopes for their own independence from the now-hated Union. It was a “week of intense anxiety,” wrote Jane Beale. 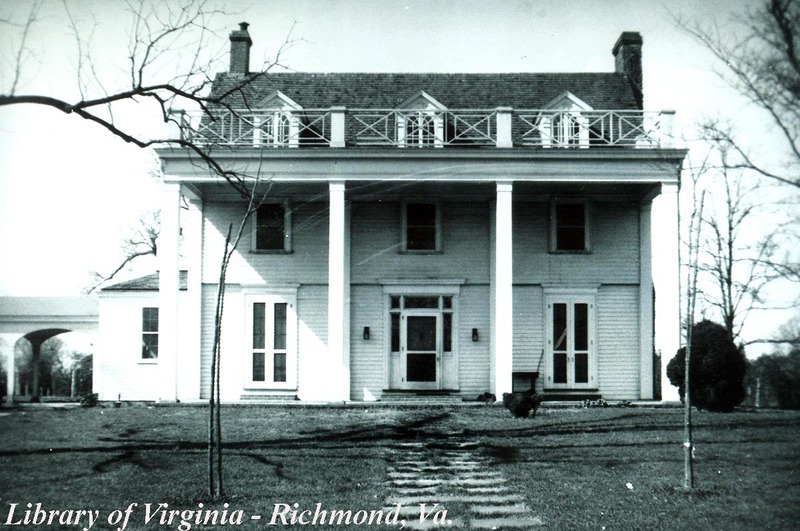 Though buoyed by word of victory, she, like many others in Fredericksburg, feared that death’s tendrils would once again touch the town (Mrs. Beale had lost a son in the Battle of Williamsburg). 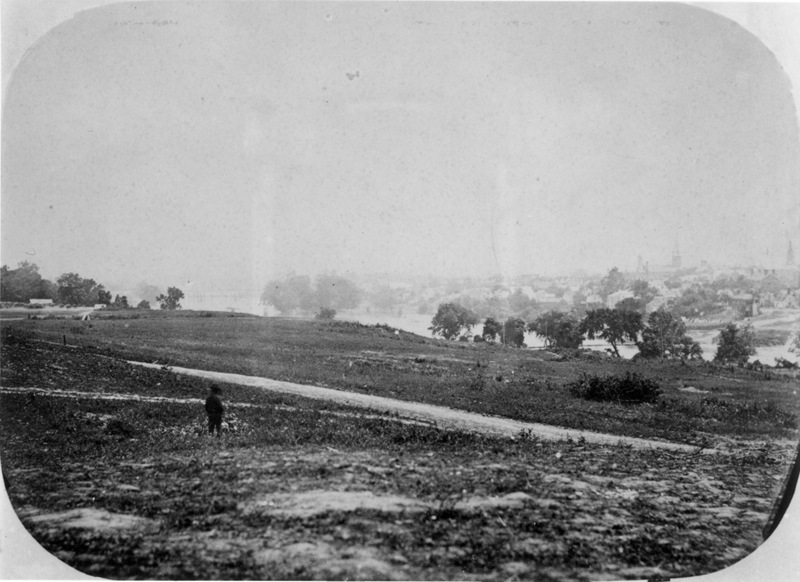 Fredericksburg from the camps of Gibbon’s brigade, in what is today Pratt Park. Many of the events held on July 4 probably took place in this field. In Marsena Patrick’s brigade of New York soldiers, the day featured a concert, speeches given upon a platform adorned with cedar boughs–purposely reminiscent of Northern forests–and the reading of the Declaration of Independence. Virtually all the batteries with each brigade fired a salute that day–the climax coming at noon, when Monroe’s Rhode Island battery, near the Phillips House, fired a salute of 84 guns. All of this was clearly audible in Fredericksburg, and that of course was partly the point. 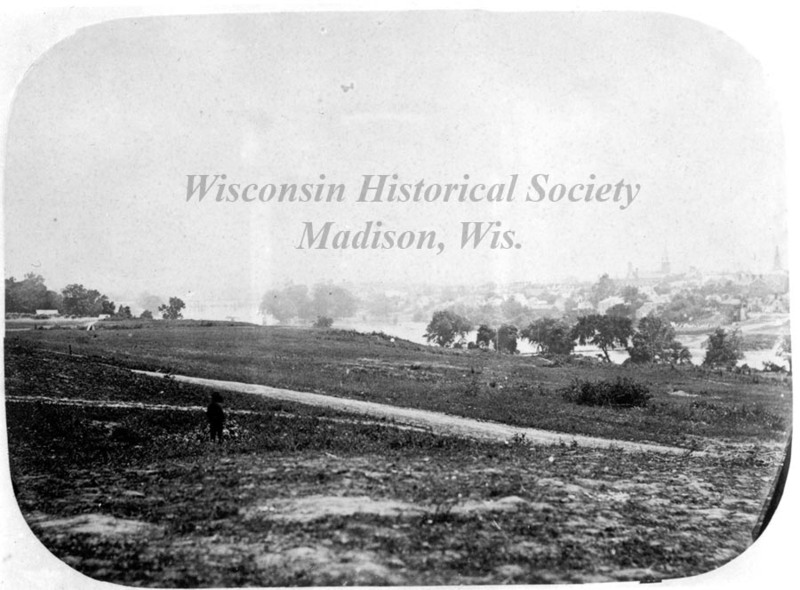 Company I of the 7th Wisconsin in what is today Pratt Park, with Fredericksburg beyond. Eric Mink will have much more to say about this and other images of the 7th Wisconsin taken that summer in a future post. But the day’s most notable events came in the afternoon, when games and races broke out all over Stafford Heights. 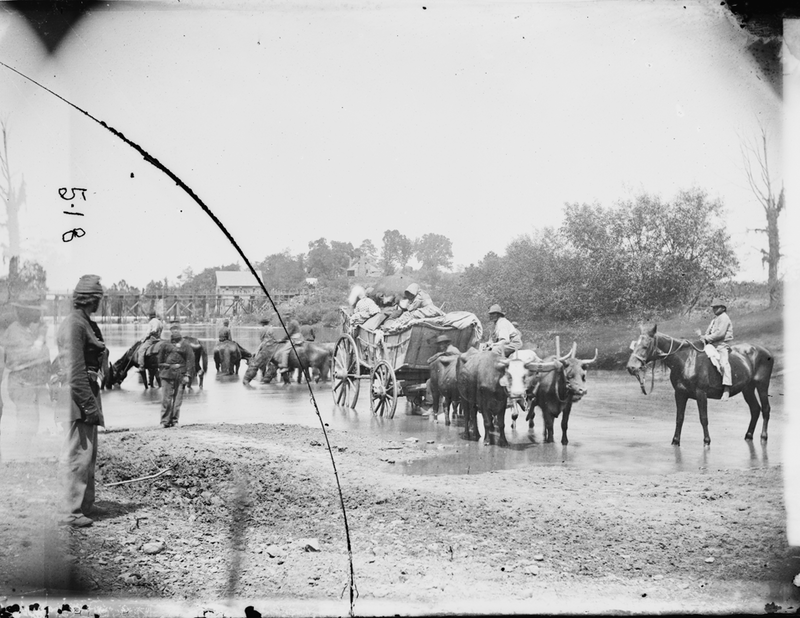 Gibbon’s brigade held a mule race, probably in what is today Pratt Park. 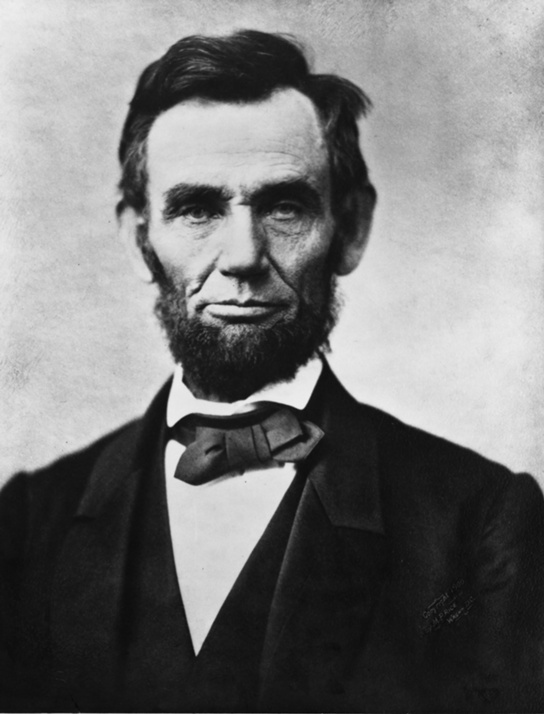 On the eve of the 150th anniversary of Lincoln’s visit to Fredericksburg, we refer you to a post we did nearly two years ago that documents pretty strongly that Lincoln visited the Sunken Road and Marye’s Heights in May 1862. You can find that post–one of our most popular ever–here. Union General Rufus King (center) on the front steps at Chatham in the spring of 1862. That’s future Union general Judson Kilpatrick at right, already looking the daredevil. Lincoln marched up these steps and into the front door on May 23, 1862 to meet with King, McDowell, Gibbon, and others. 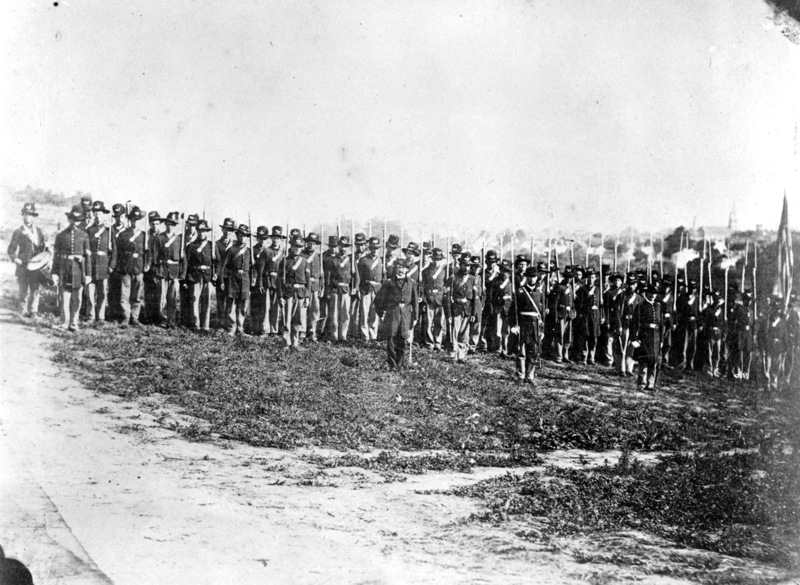 Lincoln’s May 23 visit came at a critical time for the Union army, as McDowell’s troops at Fredericksburg made final preparations for their advance south on Richmond, set for May 25. 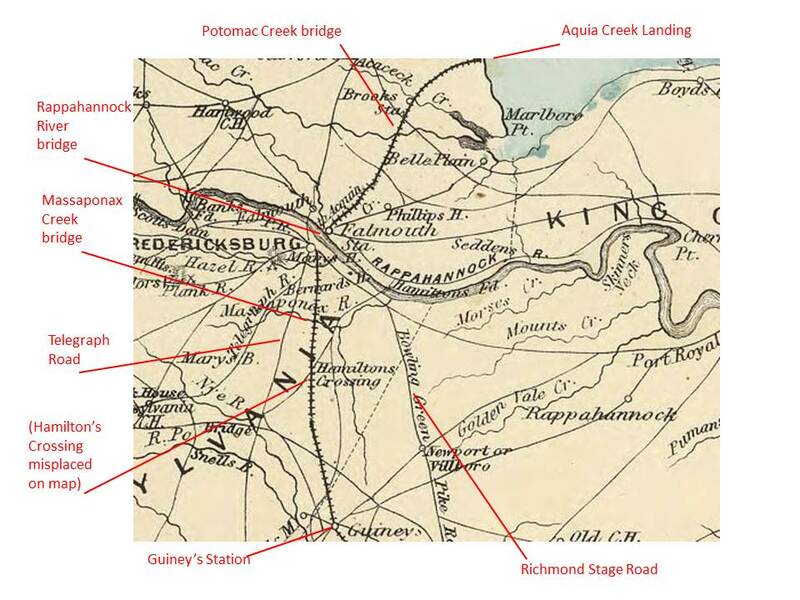 But while Lincoln was here, bad things were afoot in the Shenandoah that would completely disrupt the grand scheme, for on May 23, Jackson’s men struck at Banks’s forces at Strasburg and Front Royal. The climactic phase fo the Valley campaign had begun. Lincoln’s visit to Chatham and Fredericksburg was akin to President Obama’s recent journey to Afghanistan–very few in the army or the press knew he was coming. Consequently, the visit received little notice in the press, and indeed is scantily recorded by men in the army either. Still, there are some worthwhile nuggets and impressions that have come down to us. The dining room at Chatham, where Lincoln had dinner on May 23, 1862. A photo from the 1920s.